Summary: The party was at her house. The photos were posted to her Facebook account. That's all the evidence anyone needed to condemn Nikki Baylor for a cyberbullying incident that humiliated a classmate and nearly resulted in the girl's suicide. Now Nikki's been expelled from her old school, her friends have abandoned her, and even her own parents can't look her in the eye. With her plans for the future all but destroyed, Nikki resigns herself to being the girl everyone hates - almost as much as she hates herself. But then Nikki meets Pax, a spirited wheelchair rugby player who knows what it's like when one mistake completely shatters your life. Refusing to judge her because of her past, he shows her that everyone deserves a second chance... and everyone deserves to be loved. 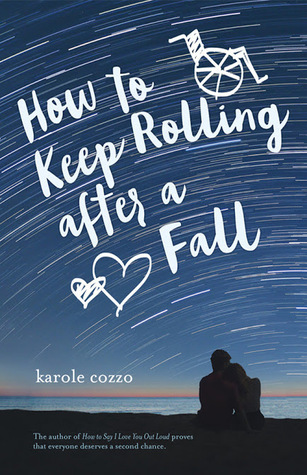 Jessica says: I love author Karole Cozzo as an author and also as a person. (She's done some guest posts here during our #LetsTalkTough blog segments, and I also loved her first novel, How To Say I Love You Out Loud.) So when I heard about this book, I was definitely intrigued and I knew I wanted to get my hands on it. I feel that the plot itself is very important, having to do with bullying and suicide, and Karole works extensively with troubled students in her personal life, so I know that experience will lend a more realistic feel to the book. So I'm very excited to read this one! Sounds like an interesting contemporary! And a Swoon Reads novel, no less. I hope you enjoy this book when you read it, Jessica!